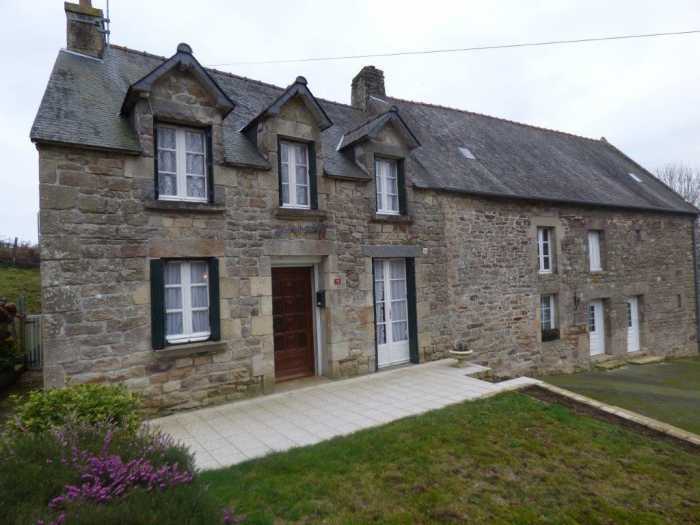 Properties for sale in Brittany, France - AHIB-1-ID2107 Saint-Gouéno 12 La Haumonaie. Good looking detached 2 bed house with 1880m2 garden. Nice looking stone house on 1880m2 garden. Ground floor: dining /siting room with log burner, separate kitchen. bathroom (bath/basin), back kitchen with WC and basin, utility room. First floor: 2 good sixed bedrooms, WC, basin, bidet. Adjoining the house is an outbuilding of 50m2 with loft above...with low beams. Needs a bit of a makeover but nice potential. The septic tank is about 10 years old. Stone built. Single glazed windows a mix of wood and pvc. Electric heating and the log burner. Prix de vente 65 000euros net vendeur, il faut ajouter les frais de négociation de 4500 euros et 6400 euros de frais de notaire. Soit un total de 75 900euros.